Welcome to our website. This is a 'work in progress' and will constantly be updated. Here's a little about us. In early 1976 we purchased our first pet Ridgeback, Tara, from the RSPCA. 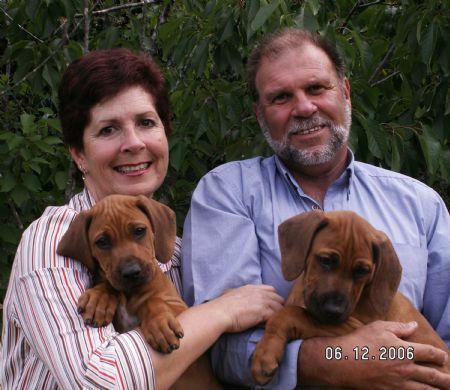 She hadn't been treated well and was fearful of men, but from this beginning grew a love for the breed, and later that year we purchased our first registered Ridgeback, Khan, and commenced our showing/breeding career with some success. Our original prefix was RAJIKI, but was amended to RIDGESETTER with the purchase of a Gordon Setter in 1984. Whippets joined the family in 1987 and Salukis in 2000. Border Terriers are also an interest as we co-owned 2 boys from Sweeping Kennels in Sweden with Hilary Spence of Padtheway Salukis and then Tui (Ch Bohunt Hissy Fit) co-owned with Gaela Whyte of Bohunt fame came to live with us. Our dogs are reared in a family environment as opposed to kennel reared dogs. Our primary objective is to breed dogs of sound temperament and as such, all litters spend their first few weeks in our house as we believe this experience equips them well for family life and the usual noises and disruptions that occur in any household. All litters bred under our prefix are planned with the aim to produce a puppy according to the standard and not just to provide dogs for the pet or show market. We do not condone the sale of puppies to pet shops or for sale overseas through agents. Our first aim is to produce happy and healthy dogs that will make suitable family companions. 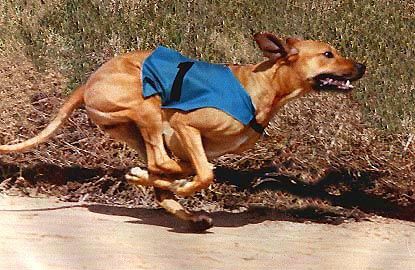 We have a keen interest in function and were very involved with coursing (track and field). 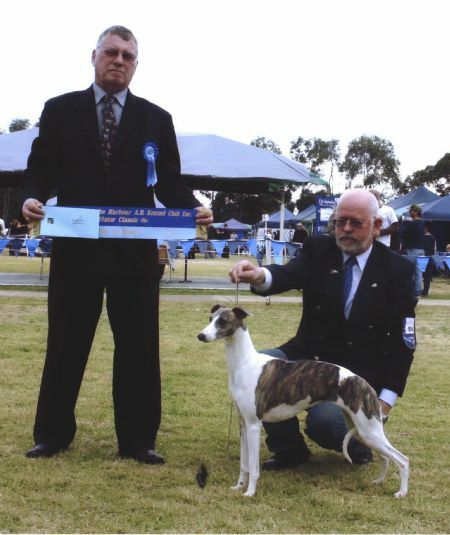 For many years, Toni was Secretary of the NSW Sighthound Racing Club Inc which we were involved with since 1979. We are both ANKC licenced judges (John is All Breeds) and both of us ANKC Assessors. For information on our groups, please see the Judging page. John, has been an assistant co-ordinator for the Hound Group Trainee Judges Scheme for several years now, but with his acceptance to the Dogs NSW Canine Judges Training Committee, he has stepped down from that role and Toni is now Hound Group Co-ordinator. John has been an assistant with the Working Dog Group, was a Committee Member of the RNSWCC Education Committee and the Constitutional Review Committee. Toni was for a couple of years, Chairperson of the RNSWCC Marketing & PR Committee and also a member of the RNSWCC Show Committee. Toni is the holder of TAFE Animal Attendants Certificate and Domestic Animal Care Certificate from TAFE and the Canine Good Citizen Instructors Course and for many years, worked in the pet industry. We live on small acreage near Camden in NSW. Our dogs have a fenced area of about an acre to run in. We are happy to answer questions on any of the breeds we are involved with and for interested persons to visit our dogs when convenient. Please check out our dogs on the respective breed pages and the profiles of our current dogs will appear on those pages.